If you’ve lived in the Birmingham, Alabama area for a while, you might very well know what it’s like to deal with so much hot and muggy weather that encourages mold growth, mildew, and stains on our home’s brick, wood or vinyl siding. Removing these stubborn specks of dirt can take too much time and effort, so power washing usually comes in handy. Aside from the fact that it’s an effective way to get rid of stubborn stains, there are several more reasons why power washing your home or business is a great idea. Pressure washing is not just a simple home-cleaning task. It is an essential preventive maintenance which can save you thousands of dollars on costly exterior surface repairs. In addition, it is one of the least expensive ways of cleaning large surfaces like your home’s exterior or a concrete driveway. The extreme winter weather can also cause significant long-term damage and stains to your home and exterior surfaces if not addressed immediately. It is strongly suggested that you don’t let the winter grime sit on your home or office for too long to avoid permanent damage. And one of the effective ways to remove these stains quickly and easily with minimal damage to the environment is pressure washing as compared with other cleaning options. Most of us prefer to do things as quickly as possible and compared to the usual cleaning methods, pressure washing can save a lot of our valuable time. You can do away with mixing cleaning solutions, climbing ladders, strenuous activities, and endless scrubbing. Hand washing is nothing compared to power washing with it comes to strength and power. You can spend all day scrubbing and get only a fraction of the results. While if you choose pressure washing, you can get rid of the filth and grime that has attached to your exterior surfaces with minimal effort. Pressure washing is an effective way of reducing allergens in and around the home. Give your exterior home a good pressure wash especially with the arrival of spring and help lower the allergen levels in the surrounding air, which can help you and your family be free of coughing, sneezing and watery eyes. A perfect way to prepare surfaces. 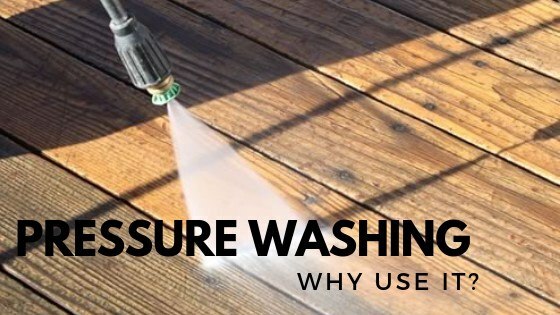 If you’re planning on painting or refinishing your surfaces, then you should consider pressure washing it as a preparation since it can clean way better than any other cleaning process or solutions. Ready to pressure wash your home or business? Leave it to the professionals for your safety and for efficiency. Get Superior Cleaning is a trusted pressure washing company and can get the job done to your satisfaction. Call us at (205) 427-5296.